I’m just getting back on my feet after being knocked down by a nasty bug that had me do nothing but lie in bed for four days. It may be the case that I’m ill in more ways than one though, because at the height of my fever, I was thinking: “Hey, I should write a post on Matt Murdock battling a cold!” While I assure you that I do have interests other than Daredevil (quite a few of them too), I clearly spend way too much time thinking about the Man Without Fear. So, Daredevil complains of radar congestion (!) and diminshed hearing because of the flu. 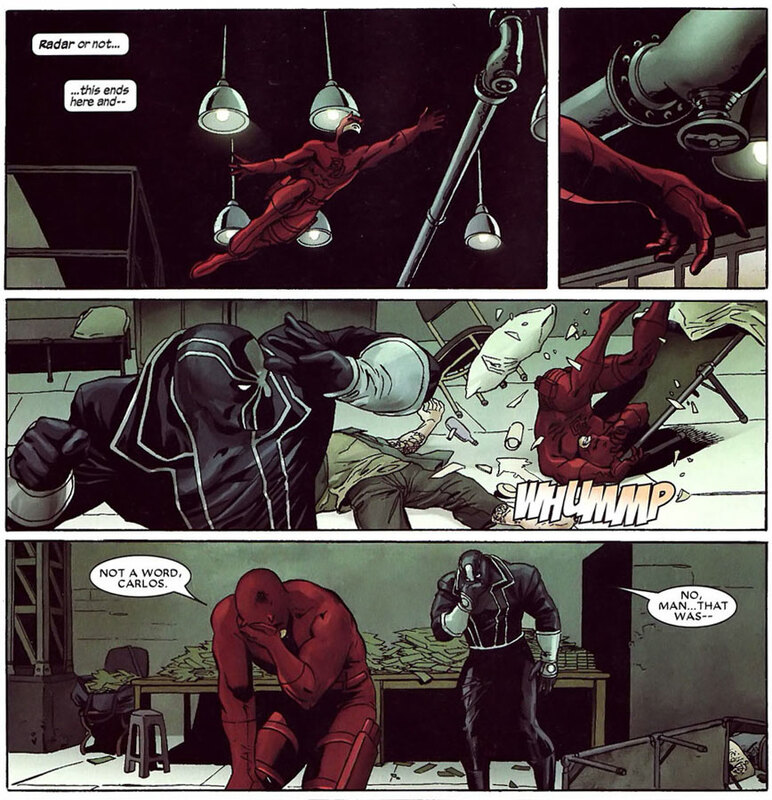 Anyone who has ever had a cold (and that would be everyone) can empathize with Daredevil in this situation. Being sick doesn’t just drain us of energy – the kind you need to successfully survive a fist fight – but gives rise to that distinctive stuffy feeling. The reason we can’t smell normally when we have a cold is that the increased build-up of mucus in the nasal cavity prevents odor molecules from reaching the odor receptors and signaling their presence to the brain. This would affect someone like Matt Murdock the same as anyone else. He would likely still be more sensitive to scents than someone without a heightened sense of smell that also has the flu (my thinking being that he either has more sensitive receptors or more of them), but the effects of a cold can be pretty dramatic, as we all know. What about hearing? Well, a bad cold or flu causes swelling around the eustachian tubes which connect the middle ear to the nasal cavity. This disturbs the air pressure in the ear and dampens the movements of the tympanic membrane and the ossicles which relay sound to the inner ear. Simply put, when you notice your hearing worsening during a cold, you’re experiencing the equivalent of a temporary conductive hearing loss. Faint sounds become harder to hear. Given the ways real life colds affects the senses (I almost didn’t eat for four days because my sense of smell was so bad everything tasted like sawdust), it makes senses that Daredevil – who probably needs that extra edge more than the rest of us – would be wise to stay off the streets. Exactly how a cold would affect the radar sense, however, depends on our understanding of what the radar sense is. If it is indeed a separate sense, anything goes. Nothing in the real world has anything to offer when it comes to understanding how a completely novel sense is affected by the common cold. If the radar sense is based on hearing and/or a more advanced combination of senses then it’s easy to imagine why a cold would constitute a minor disaster. 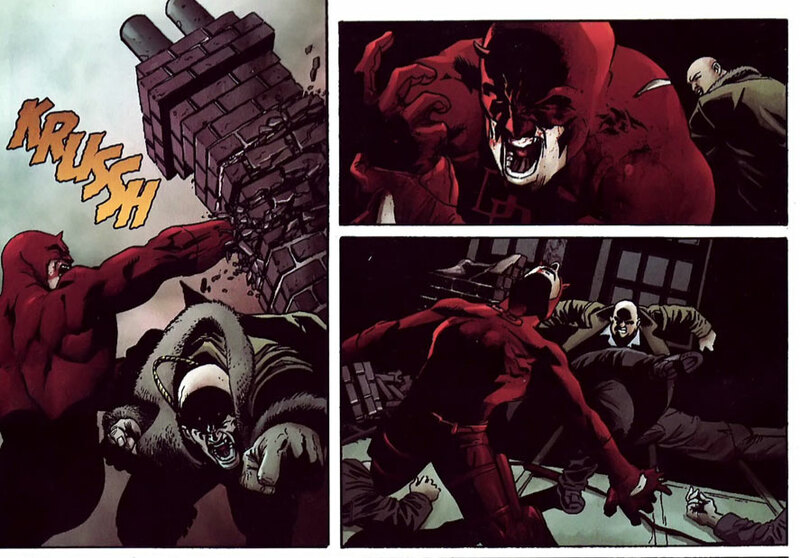 The cold scenario also reminds us that throughout Daredevil history, Daredevil’s power set has been written as relatively fragile. Matt’s senses – or his ability to use them to their full extent – have been shown to be affected by everything from excessive noise and strong odors to fatigue and blood loss. An infection clearly fits this overall picture, with the added bonus of making sense in terms of the specific symptoms. Great post, as always. I really like reading about these interesting little things which usually go unnoticed and unappreciated. I love that he goes out fighting crime anyway. Beautiful display of his psychology as well as his physiology. Thanks for this gem, Christine! 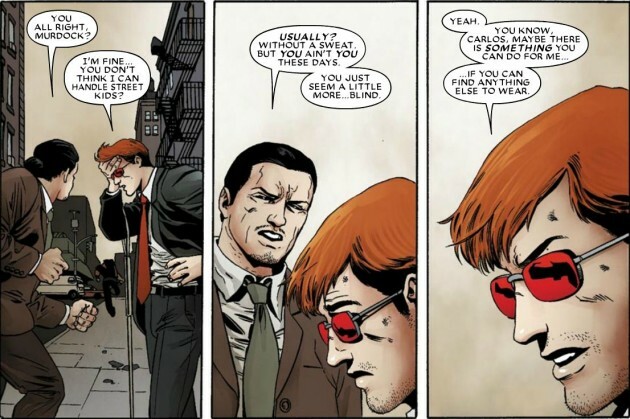 Carlos’ comment about Matt seeming to be ‘a little more blind’ is rather apt in this circumstance. If a sinus cold can interfere that much with his abilities, then having a cold must be twice as frustrating for Matt than for the rest of us. I love this. 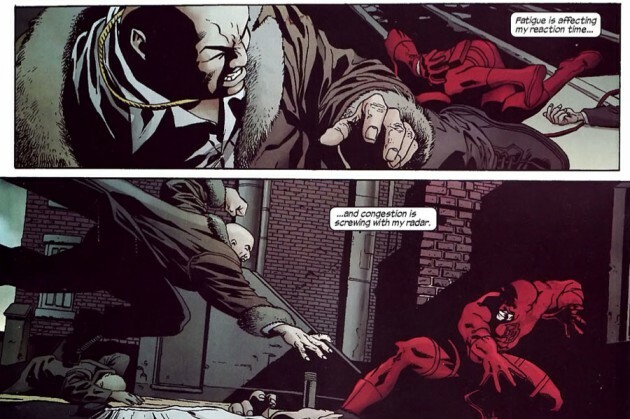 My first experience with this – as with many superhero tropes – was with Spider-Man. He’s temporarily lost his powers or had to deal with them going haywire due to a cold more than once, but the main one I remember is when he had the flu, temporarily lost his powers, and thought he was dying because of it, consequently telling the Stacy family his superhero secret. 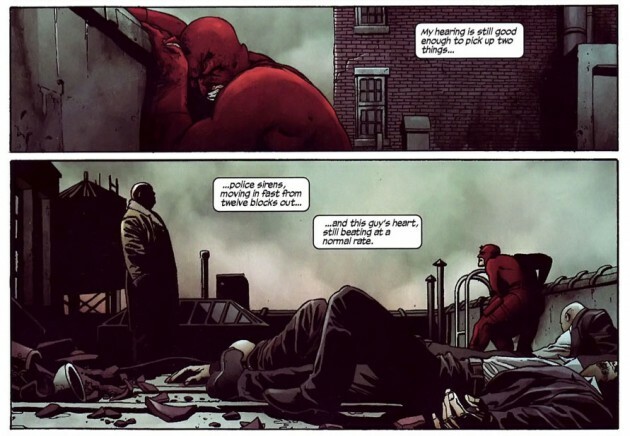 In any case, illness causing finicky powers makes much more sense for Daredevil, since it messes up your senses, including sense of balance. With that and smell being so integral to Matt’s abilities, it’s no wonder he’s all whacked out from it. Even his hearing would be somewhat compromised. In my worst sickies, it’s hard to concentrate on anything past my own breathing and heartbeat. Being all stuffed up makes it hard to focus on the outside world in any meaningful fashion.